A champion on and off the court, Martina is not only a tennis legend, but an inspirational leader who demonstrates tenacity, candor and motivation. Arguably the best tennis player ever to step on the court, Martina amassed an unmatched number of professional records over the course of a career that spanned an amazing four decades. She has won 59 Grand Slam crowns, a record 9 Wimbledon singles champions, and overcame the odds to become both one of the most successful tennis players ever and an equally successful leader. 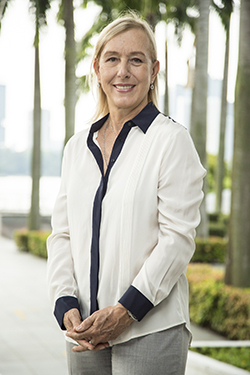 Off the court, Martina has lived an equally bold and successful life. As one of the first openly gay sports figures, she has spent much of her career overcoming prejudices and stereotypes, giving up millions of dollars in endorsements and sponsorship as a result of her insistence on living a life of integrity and honesty. Since coming out in 1981, she has been an inspiring and vocal advocate for equal rights and a strong supporter of many charities benefiting the LGBT community. She has received numerous awards from many of the most influential organizations within the LGBT community. Knowing first-hand what it takes to overcome adversity and find success, Martina is a compelling advocate for active living and aggressive goal-setting. Martina's book, "Shape Your Self," is a guide to personal fitness and healthy living. She has motivated thousands to live healthier lifestyles by taking simple steps to a better life. Martina provides her articulate, intelligent and outspoken commentary to the Tennis Channel's audience during its coverage of the Grand Slams. She has been elected to serve as the ambassador for the WTA over the next 5 years and is a regular commentator for the BBC at Wimbledon. Martina is also ambassador for BT Sport and appears regularly on their tennis commentary. She spends as much time as she can with her family in Miami, and often finds herself traveling the world, speaking at events, playing in numerous exhibition matches, and tirelessly promoting all of the issues that are close to her heart.